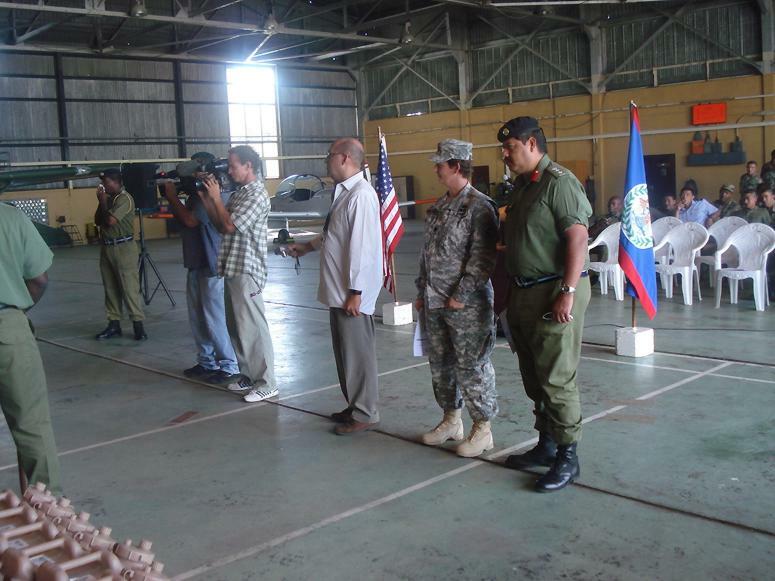 Amandala and KREM reporter Trevor Vernon, reporting from the US handing over ceremonies at BDF/ Williamson's Hanger on Tuesday this week (Jan,29, 2008). US Ambassador Dieter handing over military support equipment to the BDF valued at a million bz dollars. Beside Trevor (to his left) is US MLO Lt Col Tommy McNamara. To the immediate right of Trevor is tv5 camera man George Tillett. The Belize Defence Force (BDF) is expected to receive much more donated equipment from the US in 2008 according to BDF Commander Gillett.